Reading is, generally, a deeply private experience. The reader finds a quiet, ideally solitary place, and as she opens her book and looks down at the pages, she shuts out the world around her. (It pretty much works the same with an e-reader.) You could say she’s in communication with the author, but if so, it’s in a distant, disembodied way. She’ll experience all kinds of intense emotions, and think all kinds of interesting thoughts, as she reads, but all of this is hidden. When she’s done, she may well feel profoundly changed—but it won’t show. Generally, our typical reader likes it that way. Perhaps that makes it all the more interesting when, once in a while, she abandons her solitude and participates in an event that makes reading communal, makes it visible and audible, playful and multi-disciplinary, and even festive. She still has intense emotions and interesting thoughts, but she shares these with a temporary community, and so everyone—including the author—emerges changed, each in their own way. Juan Barker, publicity director for the Denman Island Readers and Writers Festival, knows this phenomenon well. He sees it happen year after year at this popular event, which brings about 500 participants and a dozen featured writers to Denman Island, where they transform the “downtown” area into a lively literary scene, with multiple venues offering solo readings, themed panel discussions, workshops, shared meals, and annual surprises such as a parade, a thesaurus-clad mascot, and multi-media performances. “There is something magical that happens when you bring people together to focus on ideas and on the forms those ideas are encapsulated within,” says Barker. “When people come out of isolation and participate in this kind of sharing, it’s almost like a communal ritual. I’ve seen audiences moved to tears, heard from people that they came to understand the world in a different way. This year, the festival’s main program takes place July 17 to 20, with the workshop series beginning on July 14. The participating authors range from the well-known to the up-and-coming. The festival spans genres, including poetry, fiction both short and long, and non-fiction. There will be opportunities to listen to stories, be transported by language, and reflect on the political issues of our times. “These sort of events always stimulate some really lively conversations, both at the time and afterwards,” says Barker. The stimulation of lively conversation is one of the guiding goals of the eight-member committee that makes the festival happen each year. This volunteer group meets several times a month in the winter, and much more often in the months and weeks leading up to the event. The committee members are, above all, passionate readers. They are also experienced and savvy event organizers. Barker brings a background in theatre production and conflict resolution, and a professional connection to the world of publishing, as co-owner of an independent bookstore on Denman Island. The committee also includes Denman writer and media personality Des Kennedy, award-winning author of nine fiction and non-fiction books, including his most recent, Heart And Soil: The Revolutionary Good of Gardens, which is currently riding high on the BC best-seller list. Kennedy brings valuable experience as a veteran of literary festivals near and far, providing insight into what works elsewhere. But the main model for the Denman event doesn’t come from the literary world. Rather, Barker and team take their inspiration from another form—the music festival. “Over the years we’ve changed the format to make it more festive,” explains Barker. The venues are all basically next door to each other, which encourages plenty of intermingling. “One way we’re different from most literary festivals is that the authors are here for the whole event, not just for their slot. We encourage them to bring their spouses and families. So you see them not just on the main stage and also at solo sessions; you see them in the audience, at lunches and dinners, or you might take a workshop with them. So the format naturally breaks down the barriers between performer and audience. Writer Steven Price, who attended last year as a presenting reader and returns this year to teach the Writer-in-Residence program, concurs. “It’s a unique and rather exciting literary festival. It’s the kind of event where the feel changes dramatically every year. It’s never a repeatable experience. “Every literary festival has its own feel. The Denman festival is small but I wouldn’t say modest. Inside, at the events themselves, there’s an incredible intensity, a real energy that is wonderful both as a reader and a listener. But then when you step outside of the hall there’s a very relaxed, casual feel. Everyone is approachable and the weekend has a wonderful social element. There’s a warmth and welcoming quality to it that’s rare in an ambitious literary festival,” says Price. The festival is enthusiastically, and creatively, supported by the Denman community. Approximately 70 people volunteer for all the myriad tasks associated with the festival, from decorating the halls to billeting the authors. Also, there are spin-off events in the community—the General Store last year held a complementary “jazz and poetry on the porch” event, and the Denman Audio Arts Collective set up an outdoor stage with live music, carefully scheduled to fill in the gaps in the Readers and Writers Festival program. An additional creative touch—and a fun dose of internet fame—was brought last year by Jori Phillips, a Vancouver art school student and third generation Denman Islander. Phillips attended the festival in an eye-catching dress she’d made entirely out of the pages of an old thesaurus. Phillips spent two months making the dress, which features a fitted corset, ruffled bodice, layered skirt, and stylish scalloped patterns created by clever folding techniques. It’s wearable art—and you can expand your vocabulary by reading it! Wearing a banner that proclaimed her to be “Miss Spelled,” Phillips became a sensation not just at the festival, but much further afield, as photos posted of her on social media went viral. Within days she’d racked up 80,000 views on Reddit, and been featured on major print, television, radio and digital media outlets around the world. “I’m an avid reader, and I loved the idea of a girl who reads so much that she becomes the book,” says Phillips. Barker says Phillips will be back this year with something new, but he doesn’t yet know what. “I’m confident she won’t disappoint us,” he says. The festival of course inspires not only fashion designers but also writers. The annual event provides a boost of energy and motivation for all aspiring or practising writers who attend—but in particular, Denman Island writers. “One element of our festival that is unique is our focus on local writers,” says Barker, adding that the festival always offers several sessions where Denman writers read their work, and often has an additional session for young writers (this year the children and youth will be reading with the adults). These are always well attended, including by some of the more established writers showcased at the festival, adding to the sense of community that builds during the festival. As well, the workshops provide local writers with high quality instruction that otherwise might entail an expensive trip to Vancouver or Victoria. And it brings writers together, stimulating relationships that form the basis of a local literary culture that remains active and fertile throughout the year. 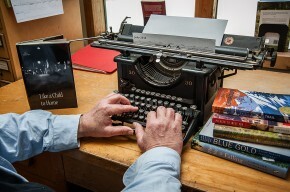 Bill Engleson, a Denman Island writer who last year published his first novel, Like a Child to Home, has participated in the festival every year since he moved to the Island six years ago, taking workshops, attending readings, and reading his own work at the local writers’ sessions. Engleson has been part of a local writers’ group that formed out of last year’s festival, coordinated by a member of the festival organizing committee. They have been meeting twice a month all year to share and give feedback on each others’ work, and will be presenting the results of that work at this year’s Denman Writers Reading sessions. “The festival is aimed at supporting a culture of reading and writing,” says Barker. It clearly is working. Barker has been involved in organizing the festival since 2007. He can’t precisely say when the festival started, but suggests that its history traces back to the early 1990s, when a Denman writer named Hillel Wright held an International Poetry Festival on the Island. Coming full circle, Wright has recently moved back to Denman and will be reading his work this year. Since then, the festival has re-invented itself several times, taking different formats until settling, about eight years ago, into its current shape with various genres, multiple venues, workshops and meals. It works, says Barker, and there are no plans to change it radically. “Right now we are at our capacity with about 500 guests per year. We don’t physically have space to expand. So instead we can work on quality,” says Barker. He encourages visitors to immerse themselves in the event. “Sure, come for one session if that’s all you can do. But it’s so much more powerful to come for the whole three days. You’ll see how ideas are introduced in one session and then picked up by someone speaking at another session. There’s an extra transcendence that happens by the end of Sunday. It’s like when you go to a music festival. It can be a cumulative experience that builds over time,” he says. For three days, you can think only about books, words, stories, and ideas, in the company of like-minded literate co-adventurers. You can go home with an expanded mind, an awakened heart, and an armful of new books, and settle down for a year of quiet, solitary reading, knowing that what appears to be a deeply private activity is also an experience of profound connection. There’s a new bar in town, and it doesn’t serve beer! It is not open until the wee hours of the morning and you will never find a dance band there. You are, however, guaranteed to have some fun, learn something new and have an extraordinary culinary experience at the new Signature Oil and Vinegar tasting bar in Comox. After more than 20 years of providing Comox Valley residents with expert wine making experiences, Signature Wines’ co-owners, Sigrid Lees and Lisa Whitmore, have expanded their business. In the 600-square-foot showroom that once housed wine-related gifts and accessories now sits a gleaming array of 37 stainless steel dispensing tanks called ‘fustis.’ However, it is not wine, but high-quality extra virgin olive oil and imported Italian balsamic vinegars that are on tap and ready for tasting. While they still do wine making, this new addition to Signature’s product line is proving to be a welcome complement to the culinary scene in the Comox Valley. Customers are raving about the selection, high quality and value of their oils and balsamic vinegars. Adding the tasting room has turned out to be a perfect marriage for Signature’s business model. It has also proven to be a boost for businesses in the Valley in general. Despite the fact that it just opened in February 2014, the tasting room is already on the map as a ‘must see and experience’ destination with local tourism operators like Island Gourmet Trails culinary tours and Island Joy Rides Cycle Tours. Before they renovated and set up the tasting bar, the business partners did their research and sampled plenty of extra virgin olive oils (EVOO) and vinegars themselves. It was important for them to ensure that they fully understood the industry and that they secured the best possible products. “We were looking to add something that would complement our wine making services,” says Lees, who opened Signature Wines more than 21 years ago. “We learned of the ever-increasing popularity of olive oil and balsamic vinegar tasting bars in the USA and some of the larger cities in Canada. We conducted extensive research into the product and the concept. Both of us already knew about the health benefits of olive oil and loved to cook with it. We felt that many others would share our enthusiasm. If you don’t know very much about EVOO, rest assured that Signature staff would be happy to enlighten you. A visit to the tasting bar is an educational experience in itself. Each of the fustis at Signature Oil and Vinegar has a feature sheet that describes the various ingredients in the product and the resultant characteristics of taste and bouquet. The infusion of herbs, fruit or nuts enhances such mouthwatering flavors as Persian lime, roasted sesame, Chipotle or Tuscan herbs. While wine, EVOO and balsamic vinegars may be vastly different, the method of sampling them is similar. Whitmore hands me a small plastic cup with a drizzle of EVOO in it, to show me how to properly taste the product. She demonstrates how to form a circle with your thumb and forefinger and place the cup in it. Next, she shows how to cover the cup with the palm of your other hand and gently swirl it around a few times, to warm the oil slightly. You remove your hand and inhale the aroma, before taking a sip through your teeth and slowly swallowing. Just as Whitmore was astounded the first time she sampled authentic EVOO, I too am taken aback by its delicious flavor and smoothness. It tastes heavenly. I leave that day with a couple of bottles of EVOO and a chocolate balsamic vinegar for myself plus a sampler pack with four empty bottles to give to a friend as a housewarming gift. She will be able to come to the tasting room to experience the products for herself and choose her favorite flavors. What a great idea! Signature will also put together gift baskets and has held several successful fundraisers for local community organizations. Once you taste and choose your favorite flavors of oil and vinegars at Signature’s tasting bar, you can dispense them into 60-ml, 200-ml or 350-ml refillable bottles provided in-store. If you have your own fancy bottle that you would like to refill, you are also welcome to bring that to the tasting room. Prices range from just $5 to $18, depending on the size of the container. In addition to learning what authentic EVOO should taste like, I also learned that you may cook with it, too. (I had previously been lead to believe that you should never heat EVOO.) Whitmore explains that the ‘smoke point’ of the fatty acids in poor quality EVOO is low, so you should not cook with it. Their superior quality products, however, can and should be used in all kinds of recipes. It turns out that this ‘new’ trend is a based on thousands of years of history. The bottom line is: EVOO and balsamic vinegars are good for you, but not all products are created equal. When it comes to the production, sale, storage and use of these products, there is a lot to know. When you are purchasing EVOO, the saying ‘buyer beware’ must be considered. Products in traditional stores may have ‘flat lined’ and already be long past the recommended shelf life when you buy them. Not only will they not taste as good, they will no longer have the same health benefits. And, speaking of health benefits, EVOO has plenty. According to David L. Katz, MD, director of the Yale-Griffin Prevention Research Centre, olive oil is a mixture of monounsaturated, polyunsaturated, and saturated fatty acids. What makes olive oil so good for you is its high percentage of oleic acid, a monounsaturated fat that helps protect the heart and may even lower cancer risk. The amount of oleic acid varies from 55 per cent to 85 per cent of the total fat content, depending on the type of olives and the site and soil in which they were grown. But oleic acid isn’t the only reason to like olive oil. It also contains heart-healthy flavonoid antioxidants and vitamin E. Extra-virgin olive oils—made from the first pressing of the best olives—contain the highest levels of these beneficial substances. While Lees and Whitmore felt it would have been great to be able to support the ‘buy local’ concept, when it comes to extra virgin olive oil that is virtually impossible. Although we can grow a lot of things here, we can’t grow olives on a commercially viable scale. We simply do not have the right climate. Our winters are too wet and cold. Our summers are not hot enough. So, despite the fact that they couldn’t ‘buy local’ they still made an effort to buy responsibly. 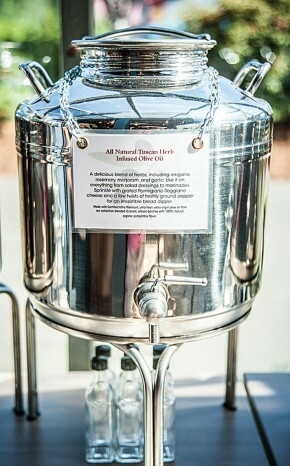 All 37 of the prize-winning olive oils and balsamic vinegars in their tasting room are non-GMO, unrefined, unfiltered and organic, with no added chemicals or preservatives—just as olive oils and vinegars were a thousand years ago. 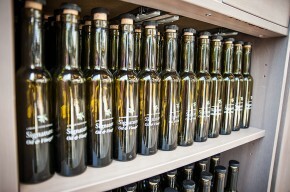 Consumers should be aware that it is not the bottling date, but rather the date the olives are pressed, that determines the shelf life of the bottled product. To ensure the best taste and maximum nutrient values, EVOO has a 12-month shelf life. For this reason, Signature Oil and Vinegar always recommends that people only purchase an amount of oil that they are sure they will use up within about six months. Signature’s line of white and dark balsamic vinegar blends imported from Modena, Italy, are also organic. Balsamic vinegar reductions are made from pressed grapes that are fermented in copper pots before they are boiled down (reduced) and then stored in barrels for 12 to 18 years or more. The longer they are left to ferment, the more intense the flavor becomes and the thicker it gets. Historically, vinegars have been used for thousands of years for their astringent and disinfectant properties, as well as being used as a flavoring and preservative in prepared food. Balsamic vinegar, however, has a wealth of benefits beyond those early uses of vinegar. The name ‘balsamic’ is believed to originate from the Italian word for ‘balm,’ meaning an aromatic resin as well as a soothing and healing agent. It was used to treat everything from headaches to labor pains. Signature Oil and Vinegar, however, only claims that their balsamic vinegars are delicious drizzled on salads, fresh fruit, vegetables, pasta or bread and used as a marinade for poultry, fish and seafood. With balsamic vinegars, you get a flavor punch without the added calories of regular store-bought dressings and marinades. Balsamic vinegars are considered part of a healthy Mediterranean diet because they contain antioxidants and are low in calories and sugar. However, while they are low on the glycemic index, one tablespoon may contain about 2.5 grams of sugar so if you are diabetic you will need to pay attention to how much you consume. A single tablespoon serving has only about five-to-15 calories, contains a negligible amount of fat and less than three grams of carbohydrates. Researchers have also discovered that balsamic vinegars can help to reduce hardening of the arteries, aid the absorption of minerals for better bone health, improve insulin sensitivity, as well as stabilize blood pressure and cholesterol levels. So, if you are looking for something unique and fun to do this summer, grab some friends and head to the bar! Signature Oil and Vinegar Bar that is! Signature Oil & Vinegar is located at 2060 Guthrie Road, Comox.